As an outgrowth of the need to find flashbulbs to put in the flash holders for my display cameras, I began a collection of flashbulbs. 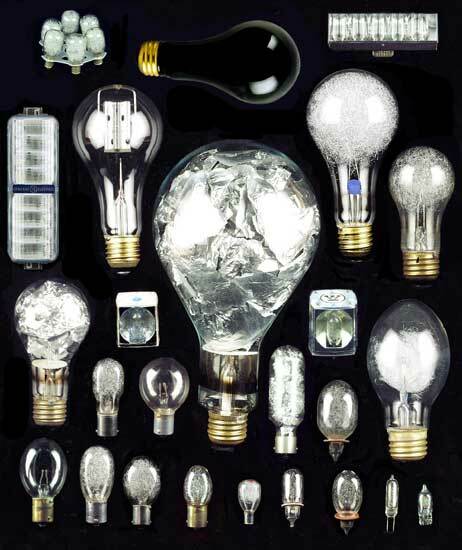 I am also researching the history of flashbulbs. The flashbulb was invented in 1928, in Holland, by the Philips Glolamp Works. The first American made flashbulb appeared in 1930. It was about the size of a household lightbulb, had the same medium screw type base, but was filled with very thin sheets of magnesium foil. Flashbulbs were popular until the 1980's, when the popularity, and the resulting low price, of electronic flash made it unprofitable to produce them. We are aware of only one company that still produces flashbulbs: Meggaflash, in Ireland. There are a few sources of flashbulbs (see links below), but they consist of individuals who buy old inventory and market them to the few users who require them for specialized photography (i.e., spelunkers), and to motion picture companies that need them for use in movies. This is what a studio flash setup used to look like: ...maybe! The following is a list of known flashbulb models by brand. There are links to photographs of many of the flashbulbs in my collection; just click on the name of the model. If you are aware of additional brands and models that I do not have listed here, please e-mail me at brittain@bright.net and let me know. Model Type Base Qty. Rare? 5R Shredded Foil Bayonet 12 (1942) Infrared bulbs. Black infrared coating. 2B Wire Medium Screw 14 Package says "Formerly Wabash"
FF33 Metal Medium Screw 1 1.75 Sec. flash duration; used for high speed motion picture photography. ZB1 Experimental Wire Wire Leads-Baseless 2 Per Bill Cress: Only he and I have these.